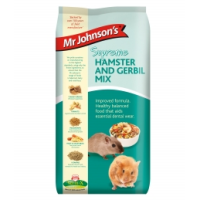 Mr Johnson's Supreme Hamster and Gerbil Mix 900g offers hamsters and gerbils a highly nutritious blend of wholesome cereals, fruit, vegetables, seeds, nuts, mealworms, pellets and extrusions to support good health and digestion. This complementary feed provides essential nutrients and a variety of textures to encourage natural foraging instincts. The deliciously fruity aroma of Mr Johnson's Supreme Hamster and Gerbil Mix is enough to entice any small furry animal! To be fed daily alongside fresh fruit and vegetables. All my hamsters love this food, tried loads of different hamster mix but they used to leave most of it, must be because they all come from Lincolnshire. To me it is good value as it all is eaten.